My first post in April of last year was about a side by side comparison of two of my favorite baguette formulations by Philippe Gosselin and Anis Bouabsa that David Snyder had previously published here on TFL. It was a tough choice to decide which one was better. The Gosselin baguette had an unequaled sweetness due to the overnight cold autolyse and the Bouabsa baguette had an incredibly complex taste due to the cold retardation. I was thinking why not have the best of both world so I started to experiment with combining the two formulations. After a couple of tries, I have succeeded in making a baguette that has the best attributes of both. The crust has nice caramelization from the extra sugar produced by the long cold autolyse. The crumb is open and soft with a slight chewiness. The taste is sweet and nutty with a complex aftertaste. 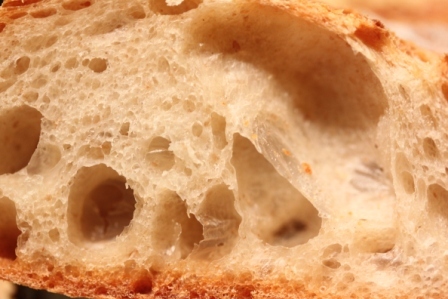 The crumb is medium thin with nice crunchiness and the crumb shows good translucent gelatinilization. P.S. Following a number of requests, here is the entire formulation. 1- Mix flour blend and ice water w/ flat beater for 1 min. and refrigerate overnight. 2- Add yeast and water and mix w/ flat beater for 3 mins or until all water has been incorporated. Add salt and beat for 3 mins or until dough slaps side of bowl. 3- Let rest 15 mins and do S&F 4 times at 30 mins intervals (1 1/2 hrs total) and 2 more times at 45 mins intervals (1 1/2 hrs total). 4- Refrigerate for 24 hours. 5- Divide dough in 3 and gently pre-shape in torpedo shape. Let rest 1 hr. 6-Gently shape baguettes and proof on linen couche for 45 mins. 7- One hour before baking, preheat oven to 490 degrees f w/ baking stone and cast iron skillet filled w/ lava rocks. 8- Mist sides of oven then slash baguettes 4 times and transfer baguettes to baking stone in oven. Immediately pour 2/3 cup boiling water on lava rocks. 9- Reduce oven temperature to 460 degrees f and bake 10 mins.Remove cast iron skillet, reduce temperature to 430 degrees F and bake for another 10 mins on convection mode. 10- Remove baguettes from oven and let cool on wire rack. Absolutely stunning... lost for words. These are magnificent, as with all the breads you post on here. Thank you very much for sharing your current recipe and process. I have already been working on this, as you know, and it was very generous of you to give me your tips before posting your current efforts. Well, my work won't match these, for sure. However I'm pleased with the results, and did manage to prove the dough the full time on the second occasion. I'm just working up to posting a new blog entry on this. I think I'm in first on this one too! Thanks for your input. It took me a few tries to get everything worked out but I am pleased with the results. The process that I described works well for me but anybody else trying it should tweak it as necessary to take into account the many variables like ingredients, environment, seasonal variation etc. I am anxious to see your version. just posted it; hope I've managed to keep faithful to your recommendations, and make appropriate adaptations along the way as necessary. That's baguette-perfection right there, Don! Those look exquisite. Thank you for sharing your technique! and I am happy to share my experiment. Great job. They look excellent! Like yourself, I've melded the two baker's techniques with a warmer than the refrigerator, but colder than room temp retardation. Thanks for your kind words and for notifying me of your own experiment. You are right, we have the same principle but the difference is my ice cold overnight autolyse does not have any yeast or salt in it. I add the remaining 15% of the water, yeast and salt the next morning and then finish kneading the dough. You seemed to have combined the best attributes of both recipes and come up with a winner. Kudos on your scoring! and thanks for your comments. I owe my scoring to the use of the newly purchased lame from TMB. ps. Since I live in DC I will have to drop by 'G Street Food' one of these days. Those are quite fabulous, Don! Your posting couldn't have come at a better time as I've had a copy of David's notes on Gosselin sitting on my dining room table for a few weeks, and just this morning was mulling them over. hours. That seems a bit more doable for me midweek and I'll definitely give it a try. Thanks so much for sharing that technique. and let me know how it turns out when you try it. 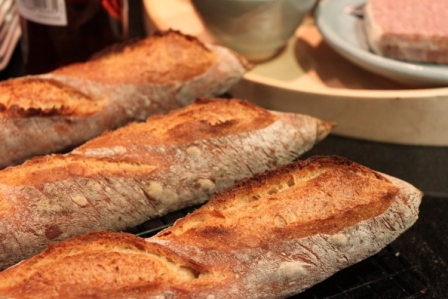 These baguettes are perfect inside out! 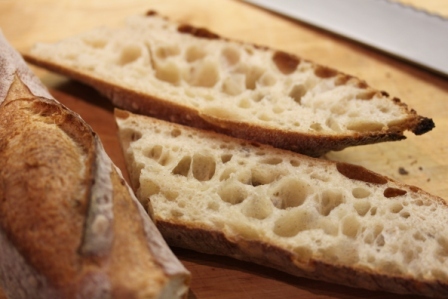 Such open crumb and such nice scoring, I am inspired to try it too. and your Nippon Baguettes are fabulous too! Those are great. A question or two: How long did you proof after the 18 hour retard/shaping? Did you give the cold dough more time? I am glad you like the baguettes. For the baguette dough, after retardation in the frridge, I divide and preshape, bench rest for 1 hour, shape and proof on couche for 45 minutes and then bake. Those have to be the most perfect baguettes I've ever seen! You've hit the jackpot! Wow! Don, those are breath-takingly gorgeous baguettes! I'm surprised that the two long cold fermentations didn't degrade the gluten more. Hmmm ... The flour addition and re-mixing after the first cold fermentation must have helped. I'd like more information about your pre-shaping, shaping, proofing timing. Did you follow the Bouabsa schedule? Congratulations on a fabulous bake! Special Thanks to you David! Without your generous sharing of the 2 original formulations, none of this would have been possible. 1- I only mix the flour and ice cold water lightly just to incorporate the water into the flour for the overnight cold autolyse so the gluten was not developed. 2- After autolyse, I use the mixer just to aid in the incorporation of the reserved water into the cold dough and not to knead the dough thoroughly. 3- I only partially bulk ferment the dough at room temperature with S&F before cold retarding it. 4- From the feel of the dough after fermentation which was silky smooth and the great oven spring that I got, I would say that the dough was slightly underproofed when I put it in the oven. I did follow Bouabsa pre-shaping, shaping and proofing schedule (see my response to pdiff above). Oh my, just so Gorgeous Baguettes, Don! What an all around beauty and I do love the crust being medium thickness. 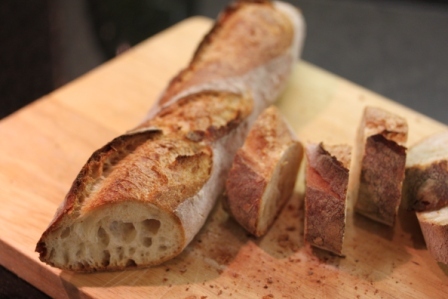 You always formulate and turn out the most Gorgeous baguettes. Thank you for sharing your results. I wanted to tell you that you have 'Nice Buns' but I though that would be a little too forward! Again, hats off to you Don! Thanks for the link Hans! I enjoyed listening to his 'from rags to riches' story. 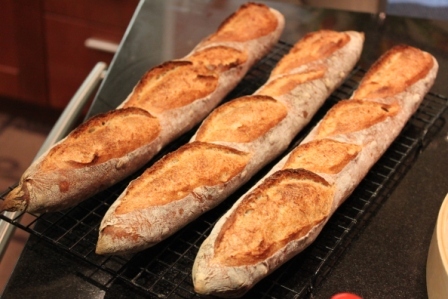 what was the method of steaming used to bake these baguettes? 1- Spray the walls of the pre-heated oven at 500 degrees (w/ baking stone on middle shelf and cast iron skillet lined w/ lava rocks on bottom shelf) with a water spritzer about a dozen shots. Be careful to cover the glass window with a bath towel because I shattered mine a couple of months ago. 2- Heat 2/3 cups water in the microwave for 2 mins. 3- Transfer proofed baguettes from couche to a peel lined with parchment paper and score the baguettes immediately. 4- Load the baguettes on baking stone and pour hot water on the lava rocks again with the glass window covered with the towel. 5- Fold the towel lengthwise and use it to cover the vent holes. Do not do this if you have a gas oven. 6- Turn oven down to 460 degrees and bake 10 mins with steam then remove the towel and cast iron pan and continue to bake at 440 degrees for another 10 mins. 7- Turn off the heat and leave the baguettes in for 5 mins with the oven door ajar. thanks for the extra info don... I'm looking forward to giving these a try. I plan on starting the process tonight. Again, congratulations on producing such wonderful looking baguettes. I'd planned on baking some baguettes anyway and was so inspired by the ones you posted, I'm making them. Right now, the dough is fermenting with the added water, yeast and salt after an overnight autolyse. I used the full 5 gms of instant yeast (1%). It took a while (5-7 minutes?) to incorporate the added water. I added about 40 gms. The dough was still cold to the touch and rather firm. I will do a S&F at one hour and ferment until the dough has expanded 50% before doing the 2nd cold retardation. I'l post on my results. I find it is easier to start with the flat beater attachment at low speed to incorporate the residual water and yeast into the cold autolysed dough. It pulls the dough into long strands. After the water stops sloshing in the bowl but is still wet(about 2 mins), I switch to the dough hook and mix it at low speed intil all the water is incorporated and the dough is smooth but not separated from the side of the bowl (about 2 mins). I then add the salt and mix at medium speed and the dough seems to dry out and start to ball up and separate from the side of the bowl rather quickly (about 1 min.). So I would say it takes about 5 mins total. I'd used the beater as you described in the past. This time, I thought I'd try using the dough hook for the whole thing. It worked. It sounds like the total mixing time is about the same, either way. I added the water, yeast and salt all together before mixing. On second thought, holding out the salt might have made it easier to incorporate the water. I've now done the S&F. The dough warmed up and relaxed dramatically in the hour in the bowl at room temp. It's a lovely dough. Ever since your first post at TFL, the ears and shaping of your baguettes have always amazed me. Please share your secrets! 1- Do not use too high hydration for the dough. I keep mine around 70%. 2- Do not oversteam. I use 2/3 cups boiling water poured on a preheated cast iron pan lined with lava rocks. 3- I draw a full scale line drawing of a loaf of bread with scoring lines on a piece of cardboard and place it next to my proofed loaves when I do the scoring as a guide in controlling my motion. As for shaping, watch the videos available on YouTube. I used to be very gentle and careful not to degas too much during shaping but I found that you can do it normally and not be overly concerned about mishandling the dough. The gas will be regenerated during final proofing and during the first baking cycle with steam. I'll keep them in mind for my next baguette bake. Ha! Ha! Awesome! Thanks, Yippee. Thaks for the recipe. I'm new to baking, I just started baking bread, mainly baguettes in the last few months. I'm totally addicted. I'm learinig the jargon and fermenting methods but have been very happy (my family likes my new hobby also) with my baguettes. I couldn't follow exactly what you did. I baked a batch tonight with your percentages, using Dmsnder's posting of Anis Bouabsa's method. They were great! I love the flavor. I'm going to make them again for a dinner party on Sunday. I am glad you like the bread. The recipe is quite simple. It is essentially the original Gosselin Pain a l'Ancienne recipe posted by dmsnyder but instead of fermenting and baking on the same day, you partially ferment the dough and retard it in the refrigerator for 18-24 hours like the Bouabsa technique. The only thing I might add is that I use quite a bit less yeast. I only use 1/2 tsp instant yeast for 500 gms of flour. I read Dmsnyder's Gosselin Pain A lAncienne recipe and your receipe again, I understand it. I'm going to try your methed this weekend. I've been using a 1/4 tsp yeast for 500g flour. With the last batch I used 575g flour with a 1/4 tsp yeast. I guess I can double the yeast. 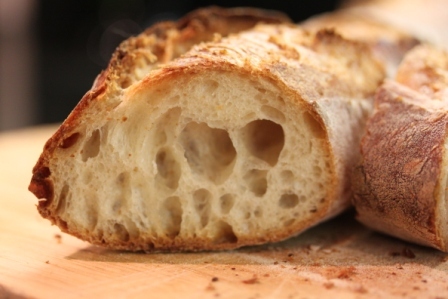 Is cake yeast used to make baguettes? I haven't seen any recipes using cake yeast. After you add the yeast the next morning, do you wait a few minutes before adding salt? I've read that that salt kills the yeast. What does "S&F" mean? I'm assuming "F" is Ferment. Where did you find the KA Organic Select Artisan Flour? Yes, you can use cake yeast in any type of baking instead of instant dry yeast. The conversion is 1 gm instant yeast = 2.5 gms fresh or cake yeast. Salt does not kill the yeast it just slows down the fermentation rate. I prefer to mix the water and yeast with the dough first until the water is incorporated then add the salt. I just like feeling the effect of the salt smoothing out the dough when it is kneaded in. 'S&F' means stretch and fold. It can be done in the bowl. Basically you place the dough in a bowl and you grab the egde of the dough, pull it up to stretch it and fold it over the opposite corner of the bowl about 2/3 of the way. Rotate the bowl about 1/8 of a turn and repeat 9 more times until you have done a little over a full rotation of the bowl. You do this S&F every 30 or 45 mins four times during bench fermentation. KA Organic Select Artisan Flour is sold through commercial bakery suppliers and comes in 50 lbs bag. I get mine from Hillcrest Foods in Saratoga, NY. I should neve assume anything! I'm making your baguette recipe tonight, starting with the autolyse. I'm using AP organic flour from Heartland Mill and Arrowhead Mills Organic Rye. I'll let you know how they turn out. Hi, Don, I'd like to try your recipe, but I have a question regarding the temperatures. You say "preheat convection oven to 490 degrees F", but in your "Step by Step Baguette Routine" the preheat temperature is 500 F.
Please enlighten me on this. My mistake, I should have said "preheat oven to 490 degrees F". I have edited the post to reflect this. The idea is to bake on regular heat at 460 degrees F with steam and then finish off with convection bake without steam at 430 degrees F to achieve the thin crackly crust. I hope this helps. for getting back to me so quickly. I will bake the baguettes next weekend, soon as we get back from our daughter's graduation in Montreal. A very nice baguette indeed. There really is a nutty sweetness to the flavor. I slipped up and added too much water...I tried adding extra flour to compensate but that hydration was still too high and the crust was thin...grigne but no ears. I'll definitely keep trying until I achieve the sort of beautiful loaves you've shown us. There is really nothing wrong with a thin crust as long as it is crackly and not soft. Personally, I find it desirable and the use of convection bake at the end really helps in achieving that.